HurryOut team would like to extend an invitation to the HurryOut Launch Party to two chocolate loving fans of Finding Fine Chocolate! 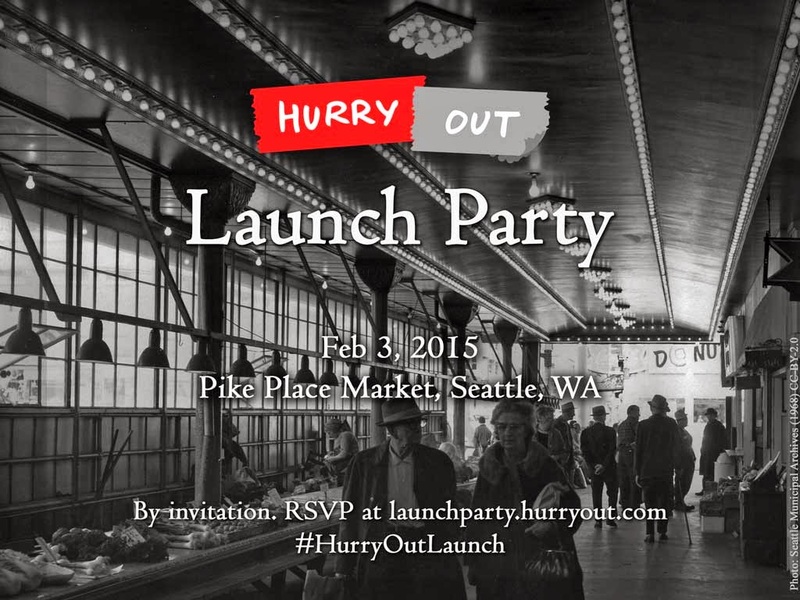 HurryOut recently launched its first mobile app and is throwing a private celebration at Pike Place Market on the evening of Tuesday Feb 3. You'll meet the HurryOut team, mingle with early users of the app, as well as local artists, performers, and other members of the Seattle events scene. Enjoy drinks, light food, and live entertainment from local artists. The event is by invitation only. Directions and more details will be provided in the invitation if you are one of the lucky winners. Here’s how you can win an invitation to the HurryOut Launch Party for yourself and a guest: Just let me know you are interested by commenting on this post. Comment on any platform. (I'll be posting on Facebook, Twitter, G+, Instagram, and Tumblr.) I'll be drawing two random names from those who comment. It is that simple! Don't delay! Winners will be chosen at MIDNIGHT on SUNDAY JANUARY 25, 2015! HurryOut is a tech startup in Seattle. Its mission is to make it incredibly simple to find events you’ll enjoy, among hundreds in Seattle. Street fairs, live music, theater, art exhibits, nightlife… you name it. I'll be posting all future chocolate events for Finding Fine Chocolate there too. Enjoy your weekend and make sure you enjoy some fine chocolate!